Kenny Irwin’s RoboLights is, well, let’s just say it is unlike any other holiday light display you have ever seen. The attraction features tons of lights as well as aliens, robots, and plenty of surprises made up from old furniture, scrap metal, old vacuum parts, toilets, and more – all from artist Kenny Irwin. 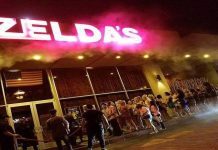 You can find Roblolights at 1077 East Granvia Valmonte in Palm Springs – usually open every night from Thanksgiving to through the beginning of January. More: Need a place to stay in Palm Springs and the Coachella Valley? 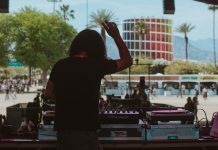 Check out the the best deals in the Greater Palm Springs Area from our affiliate partner, hotels.com. 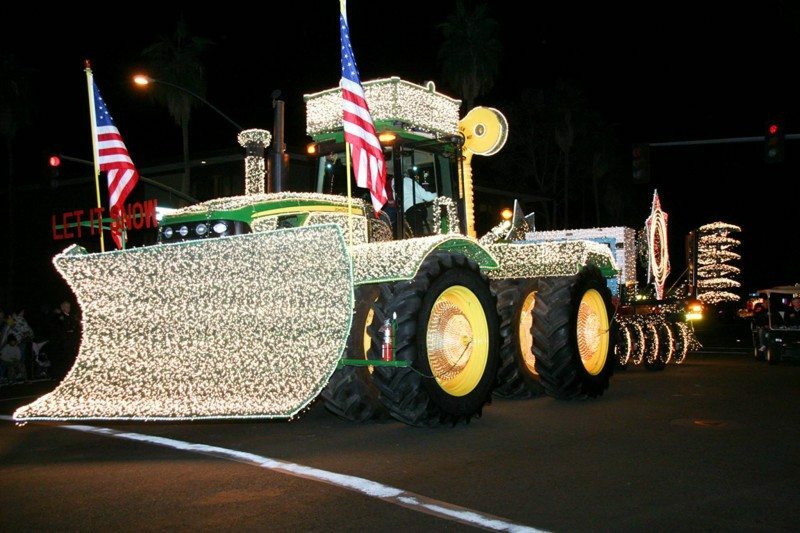 The annual Festival of Lights parade takes place in downtown Palm Springs on the first Saturday night in December. The parade includes decorated floats, marching bands, a Grand Marshal, and, of course, Santa Claus. 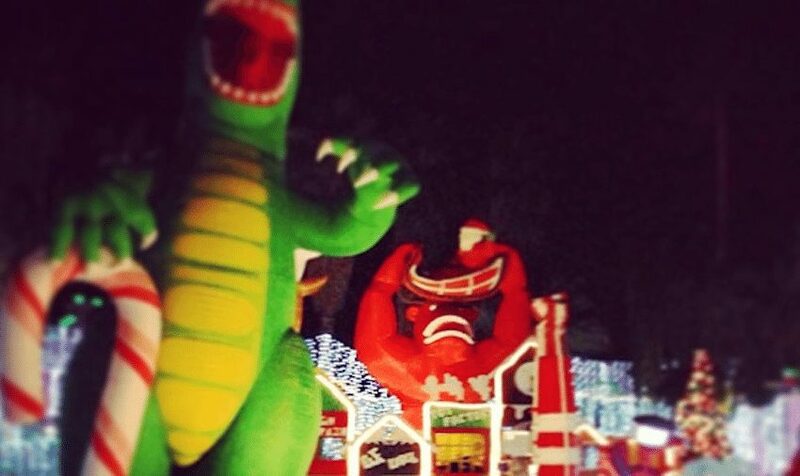 The Festival of Lights Parade takes place on Palm Canyon Drive in downtown Palm Springs. 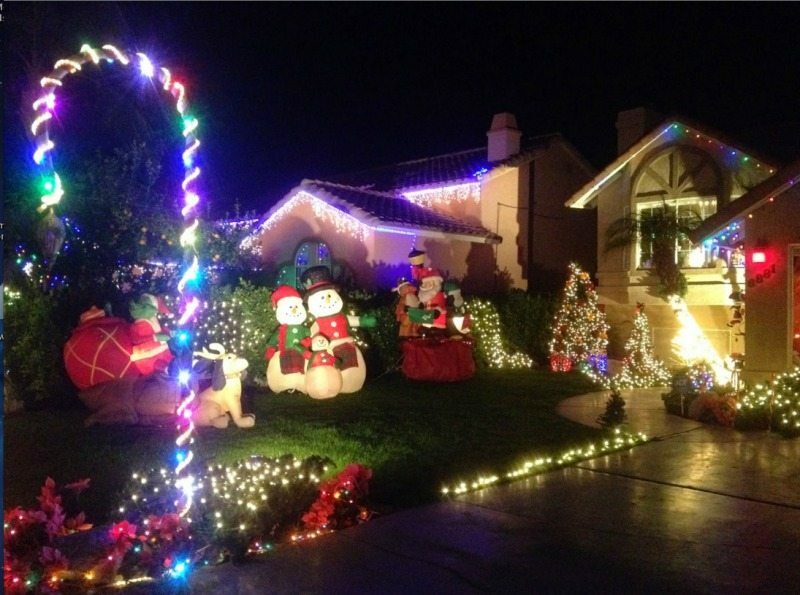 Cathedral City’s Minerva Road (a few miles east of Palm Springs) transforms every year into Candy Cane Lane – with almost every house on the street going all out with lights, decorations, music, and more from Thanksgiving weekend through New Year’s Day. 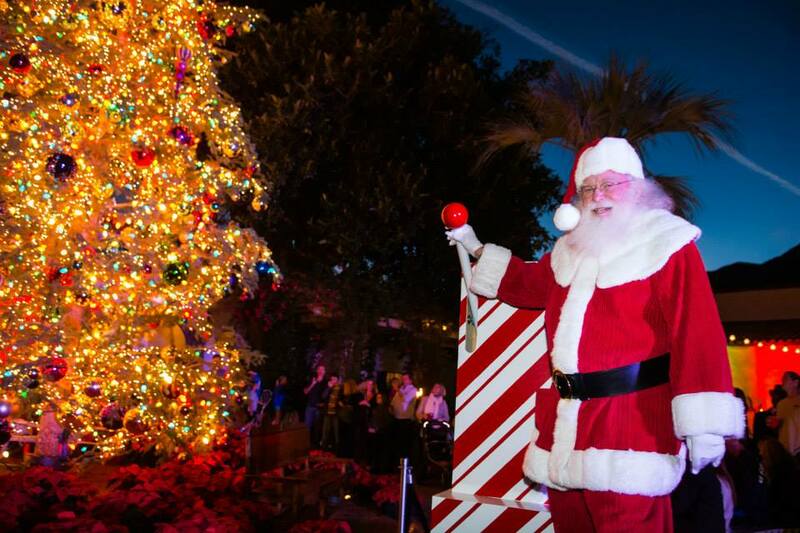 Candy Cane Lane is located on Minerva Road between Avenida La Vista and Tachevah Drive. .
More: Here’s everything else happening in Palm Springs in December. The Living Desert’s annual WildLights hosts almost a million lights and tons of displays. There is also live entertainment, food & drink, camel rides, Santa Claus, and animal encounters. The event traditionally runs from Thanksgiving Weekend through Christmas at the zoo. 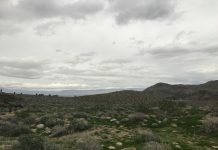 The Living Desert is located at 47900 Portola Avenue in Palm Desert. WildLights runs on select nights (see the schedule here), $10 for adults and $8 for kids, members, and people with military IDs. Children under 3 are free. 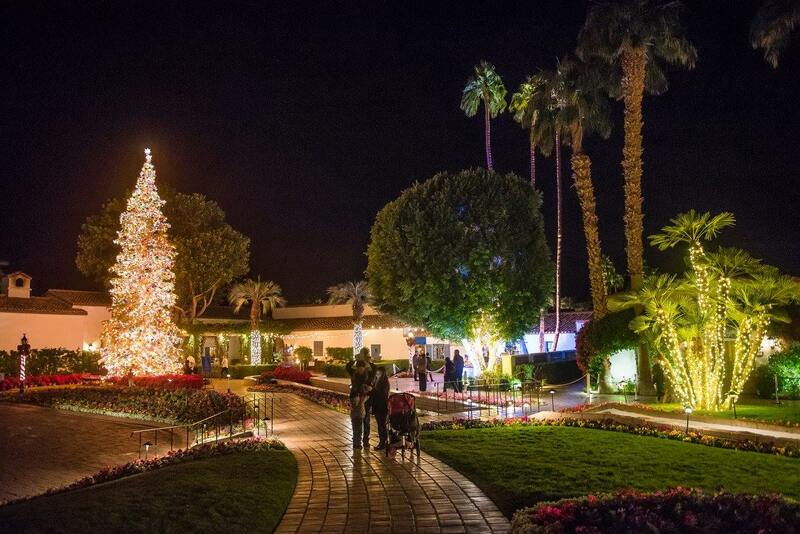 Every season, La Quinta Resort gets festive with decorations, lights, and carolers on the plaza. It usually also features chestnuts roasting on an open fire, shows Holiday movies, hosts visits from Santa, and a nightly Menorah lightings through Hanukkah. La Quinta Resort & Club is located at 49499 Eisenhower Drive in La Quinta. 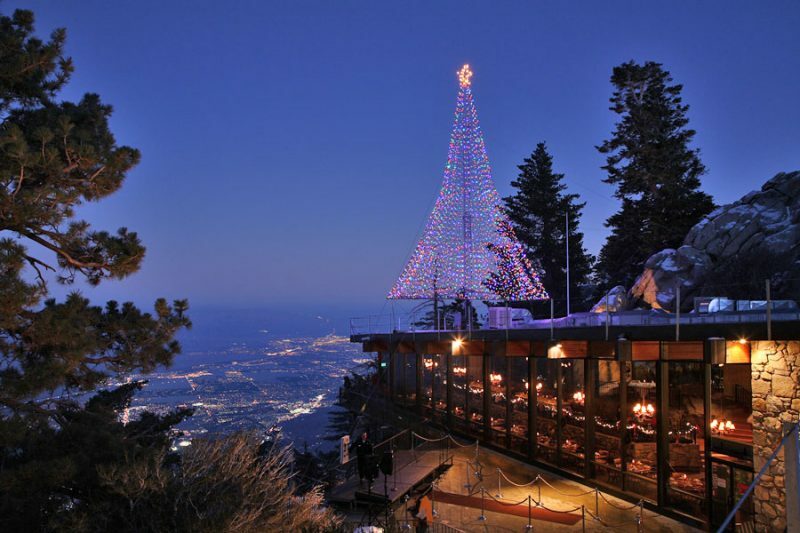 The Tramway gets Palm Springs in the Christmas spirit with a tree lighting ceremony in early December. There is also traditionally a few visits from Santa at the top of the tram during December along with Christmas music from local schools and performers and, if the weather gods cooperate, snow! Palm Springs Aerial Tramway is located at 1 Tram Way in Palm Springs. Tickets are $24.95 for adults, $16.95 for kids, and $22.95 for seniors. That weird made-for-TV flick starring Ian Ziering that is set in Palm Springs usually airs a few times on obscure tv channels during the holidays. 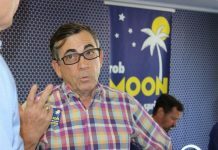 It’s terrible even for a made-for-tv movie, but it does feature a lot of Palm Springs and concludes with a bizarre performance at the Festival of Lights – so it has that going for it. Have a great Christmas in Palm Springs!